Jayson Werth celebrated a career milestone at Nationals Park on Saturday night against his former team the Philadelphia Phillies as he launched his 1,000 career hit off a pitch from right-handed reliever Zach Miner to the left field bleachers for a two-run, go-ahead homerun in the seventh inning. The Washington Nationals would go on to beat the Phillies 8-5 in a game that looked nearly out of reach early on. Despite all of the unfortunate missed opportunities the Nats have lived through in 2013, Saturday night’s game was a nice example of what the team can accomplish if they work with what they’ve. Right-handed starter Taylor Jordan had a rocky second inning versus Philadelphia in which he gave up four runs leaving Washington in an early rut. But that wouldn’t be the end all of the night. For the first three innings of the game, the Washington offense did more of the same of what we’ve seen all season. Three men reached in the first three innings – Denard Span hit a leadoff single and Bryce Harper drew a one-out walk in the first, and Ian Desmond took a leadoff walk in the second – but the Philles left-handed starter Cliff Lee shut them down. Washington tacked on a couple of runs in the fourth inning when Ryan Zimmerman scored on a single hit by Werth up the middle and Werth would soon follow on a double hit by Desmond, but that would make it a 4-3 ballgame in favor of the Phillies. Jordan finished strong and posted three scoreless innings after the four-run Philadelphia rally in the second. He pitched a total of five innings while giving up seven hits, four runs (one homerun), and threw one wild pitch. He walked one batter and struck out three over 77 pitches (54 strikes). Jordan would not get the win but rookie reliever and right-handed pitcher Tanner Roark would. He is now 1-0 after tossing a pair of scoreless innings during the sixth and seventh leading up to the Nats’ huge five-run rally in the seventh inning. The Nats’ offense batting around their order with Philadelphia facing 10 batters total. Pinch hitter Steve Lombardozzi kicked things off against left-handed reliever Jake Diekman drawing a walk. Span would then lay down a sacrifice bunt moving Lombardozzi to second. Lombardozzi then stole third during Ryan Zimmerman’s at-bat in which he walked. 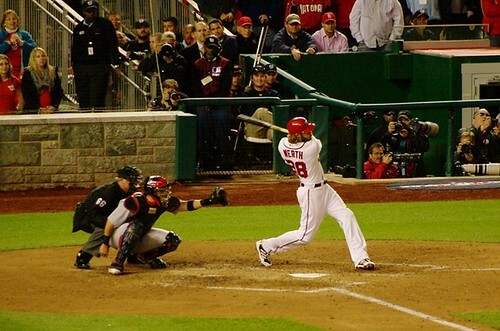 With two men and one out, the Lombardozzi initiated the Nats’ big rally by scoring on a Harper bunt – a move called by Manager Davey Johnson from the dugout – sending Lomboardozzi home. The Phillies would proceed to change pitchers but Miner did not fare any better than Diekman did. In fact, he did worse. Washington’s offense pounced all over Miner in the seventh and Werth’s big two-run homer came on the first pitch he threw. Harper scored on that play followed by Desmond hitting a ground-rule double down the left-field line. Miner proceeded to intentionally walk Adam LaRoche before Wilson Ramos joined the hit parade. With the bases loaded and one out, Anthony Rendon hit a two-RBI single to left-center field giving the Nats an 8-4 lead. Philadelphia would tack on just one more run against right-handed reliever Tyler Clippard in the eighth when outfielder Dominic Brown hit a solo homerun with one out but closer Rafael Soriano would enter the game to shut things down. Soriano faced three batters in the ninth before securing his twenty-ninth save of the season.